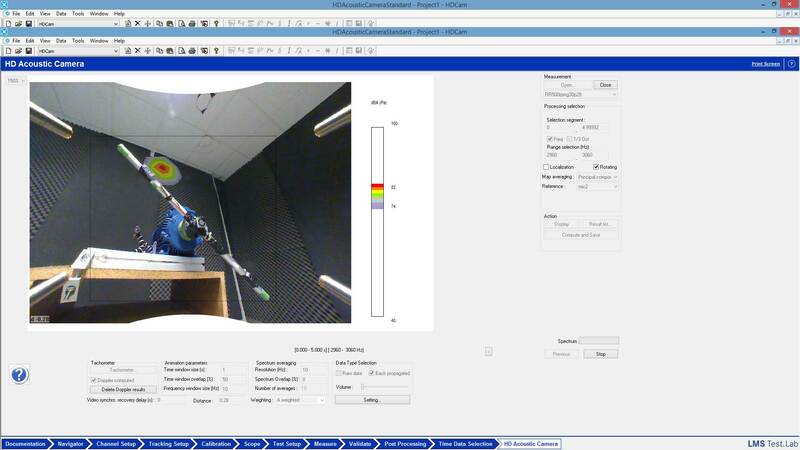 Locating sound sources is a qualitative assessment which is part of an acoustic diagnostic approach and responds to various problems: troubleshooting, leak detection, identification of a noisy component etc. 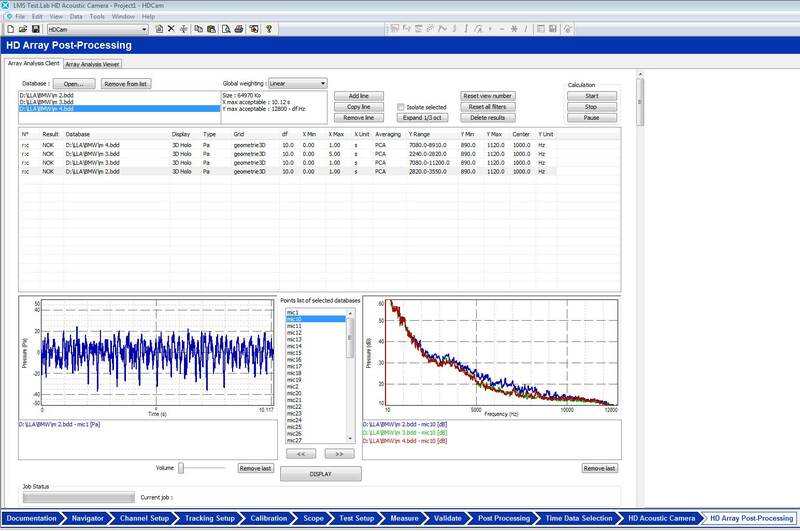 To provide the best solution, MicrodB software products are interfaced for any measurement technique and for any source or array surface geometry. They also offer a wide range of acoustic imaging methods to quickly represent the optimal measurement performance and map of noise sources using Pressure field / Intensity propagation. 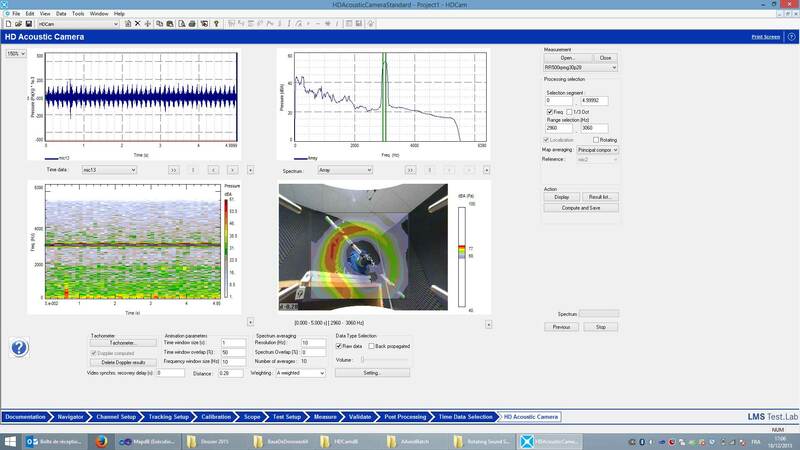 The acoustic camera software product LMS SoundCam and HDCam offer an optimized beamforming and nearfield focusing processing for planar waves to provide a quick display of the first real time localization maps. In post-processing, the deconvolution, acoustic holography or Bayesian focalization are necessary for a better dynamic and sound source separation in low frequencies. For internal spaces, the acoustic camera software product 3Dcam couples the spherical beamforming and the equivalent source method. Understanding the location of noise sources alone does not provide information regarding the cause of the generation of the noise but only regarding its emission. Methods of source separation provide this additional information. Using a measurement array of microphones and possibly other sensors combined with coherence methods, it is possible to combine a method of source separation and a method of localization in order to associate an acoustic output with a physical phenomenon. 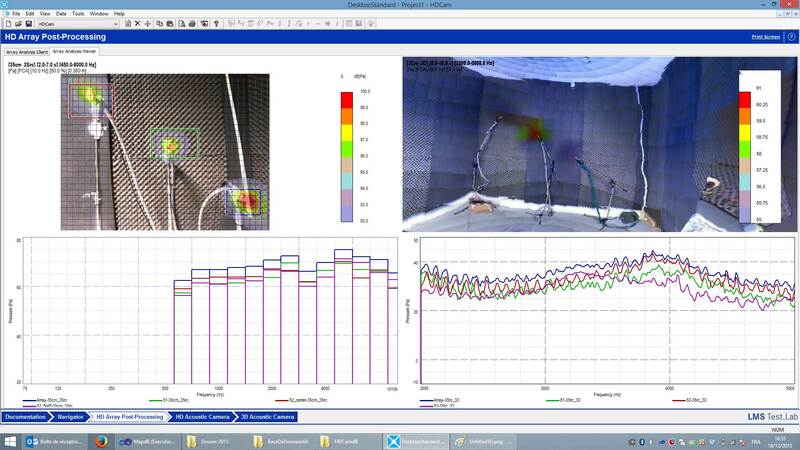 The HDCam and 3DCam software offer these methods making it possible to either eliminate measurement noise by cross-spectral matrix processing (principal component analysis or diagonal removal), to display only consistent sources. The combustion noise module associated with HDCam uses cyclo-stationary Wiener filtering to separate noise sources related to the combustion noise from other mechanical sources on an engine. The rotating source module also serves to separate stationary sources which would be related to the fairing or to the rotation axis from mobile sources located on the blades. Some acoustic imaging methods can also be used to determine quantitative information which can be useful when sizing an acoustic solution. In an anechoic environment, the sound power of a source can be quantified with the same precision as ISO standard of measurements (such as sound intensity) which are normally used to determine sound power. A method of regular acoustic holography or generalized acoustic holography (GAH) for any geometry offer identical performance to ISO standard of sound intensity measurement. Far field deconvolution or Clean-SC applied to beamforming map also give information regarding the power distribution of equivalent sources. 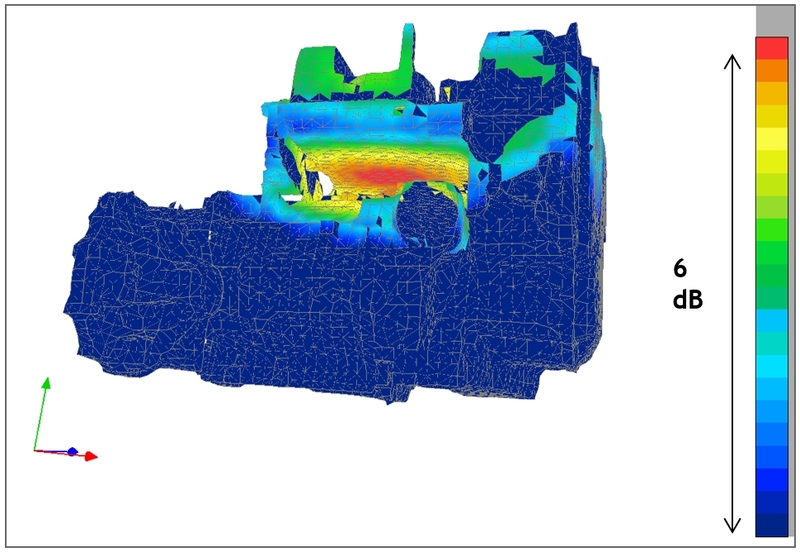 For internal spaces, the 3DCam software product provides a unique method for determining the source area contribution to the measurement point. It is thus possible to understand and treat problems showing the effect of those treatmentsincreasing the efficiency of damping and sound isolation. To speed up the acoustic source characterization process during diagnosis and when determining the effect of acoustic solutions, two complementary tools to MicrodB products provide significant computational power and speed of analysis. Using calculation algorithms developed in C ++ and multi-platform hardware that utilizes the power of CPU multi-core machines and GPU cards, it is possible to undertake multiple parallel calculations. The same treatment can be quickly applied to all measurements for comparative analysis. Acoustic imaging produces a large amount of data that can be difficult to analyze and compare: source maps for several frequency bands, several measurement configurations, different processing methods etc. The “Array analysis” reporting tool allows fast data selection from a spreadsheet and displays that data with common scales for easy comparison, with the option to export to reporting tools. To accelerate and refine the acoustic source characterization process, software tools manage the temporal and spatial synchronization of video and audio data. For relatively flat surfaces, the hologram is superposed on a photograph or a video. For internal spaces or engines, MicrodB has developed its own scanning tools. 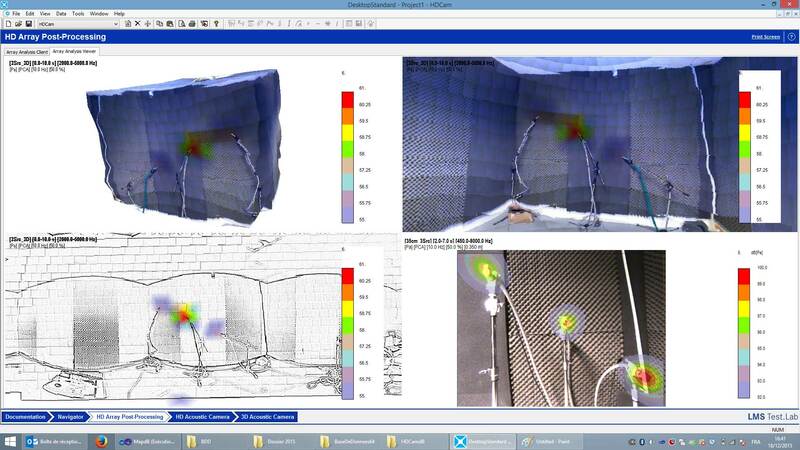 These tools generate a virtual acoustic mesh upon which the image of the measured area is superimposed. This 3D representation facilitates the display of results, improves details for source location, and presents source location in a visual context. MicrodB is able to understand individual client needs and develop a customized product(s) for identifying specific sound sources. Our experience and our software and hardware base provided by standard products guarantee a practicable solution for our clients’ needs. In addition, our team of experts can assist clients when defining requirements, specifications, designing solutions or choosing processing methods.